Thu, Jan 17, 2019, 09:51 pm SL Time, ColomboPage News Desk, Sri Lanka. 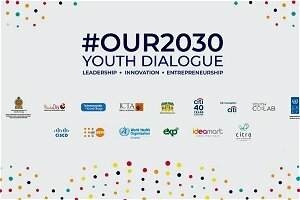 Jan 17, Colombo: The United Nations Development Program (UNDP) in Sri Lanka announced that for the second consecutive year it will hold a dialogue next week on Youth Leadership, Innovation and Entrepreneurship with the participation of 200 youths. The UNDP said Today's generation of young people is the largest the world has ever known. One in every three people alive today is under the age of thirty, and around ninety per cent of these young people are living mainly in Asia and Africa. In Sri Lanka alone, nearly a quarter of the population is youth. They are a critical segment of the country's population; and investing in their potential can play a huge role in how Sri Lanka achieves the vision of a sustainable tomorrow. To realize this vision, the United Nations Development Program (UNDP) together with the Ministry of National Polices, Economic Affairs, Resettlement & Rehabilitation, Northern Province Development, Vocational Training, Skills Development & Youth Affairs, the Ministry of Digital Infrastructure and Information Technology, the National Youth Services Council (NYSC), the Information and Communications Technology Agency of Sri Lanka (ICTA), Citi Foundation, and Youth Co Lab (a program co-led by UNDP and Citi Foundation) are coming together to host '#Our2030 Youth Dialogue: Leadership, Innovation and Entrepreneurship' bringing together 200 young people from across the country on 22 January 2019. Held for the second consecutive year, this dialogue aims to constructively engage participants on youth development to create more sustainable, peaceful and inclusive societies both locally and globally. The dialogue provides an ideal opportunity not only for young people but for other actors such as the public and private sector, UN agencies, civil societies, academia, and other stakeholders working with and for young people, to engage in a meaningful conversation on localizing the new 'Youth 2030: UN Youth Strategy'. Parallel to this dialogue, the pre-incubation program of the 'HackaDev: National Youth Social Innovation Challenge' will take place for the selected teams, which is the final phase of the challenge before they proceed to further developing their idea with the aim of becoming social entrepreneurs. A joint initiative of UNDP, the Ministry of Digital Infrastructure and Information Technology, the National Youth Services Council and the Information and Communication Technology Agency of Sri Lanka, in partnership with Citi Foundation, Citra Social Innovation Lab, Youth Co Lab, Dialog Ideamart and Expo Lanka Holdings PLC. HackaDev is a key element within the social innovation ecosystem which represents concrete action in engaging young people to meaningfully contribute to the development of the country and the 2030 agenda. The Advanced Coaching session of the 'Technopreneurship for Social Change' program, another youth initiative, will also be running parallel to the Dialogue. A joint initiative of UNDP, Citi Foundation, Cisco and the National Youth Services Council, the 'Technopreneurship for Social Change' has reached more than 1000 young people from around the country in 2018 through 20 programs held in 20 locations through e-learning courses on leadership, financial literacy and entrepreneurship. The Dialogue will end with a recognition evening for 16 HackaDev teams who will receive seed finding and incubation support as a part of the HackaDev 2018 edition and 70 participants from the 'Technopreneurship for Social Change' program who have successfully completed the coaching program.